It is a short rhyming picture book. I’m so amazed that it brings us through a hockey game from the first puck drop to the final buzzer with such limited words. The rhyming is smooth and perfect, like a sing-along song for bedtime. So it serves really perfect for bedtime story. It will bring calm and good dream to children, especially little sport lovers. The illustrations are vibrant, engaging, full of actions and capturing the sport from various angles. All the details are very charming too. Parents can show their children all the stuff about the sport, older ones will also enjoy looking for and pointing out the items. It’s such a visual pleasure to read the book. It’s a book perfect for early readers, and all hockey lovers. This book tells a migrant’s tale, since myself being one, books on this topic always draw my attention. This picture book by Duncan Tonatiuh touches on the subject in a very courteous and gentle manner. It brings to light the hardship and struggles faced by thousands of families who seek to make better lives for themselves and their children by leaving their home. It even has plot of the rabbit and coyote illegally crossing the border. This can lead into an educational discussion (in class or between parents and children) about immigration, which can also open up children’s eyes to what is going on in this world. The flat illustration style is very unique, like paper-cut characters stick to the background, which gives it a hand-made craft feeling, a perfect choice for a culture book. The content includes many Mexican traditional food (such as tortillas, aguamiel), tools, traditions (like papel picado, which became famous from Movie Coco) children will learn a lot about the Mexican culture. I believe this is a book every migrant and people who are interested at immigration life should read. A little heads up. Usually I post my reviews on books I read and products I used on Amazon. I found it easy to post and share. But recently for some reason I’m still unsure Amazon wiped ALL of my reviews. I searched online some people met the same issue and it seemed there is no way to recover it or even to dispute. Well, it upset me, but it won’t stop me sharing my reviews on books. I just find reviewing is not only a good way to truly enjoy and learn from a lovely book, but also a great way to help people. So I guess it’s time to resume this blog. I want to start with this lovely picture book called Bell’s Big Move by Tom Shay-Zapien. It’s a simple lovely story about a girl Sophia and her puppy Bell moving with family to a different place and they made new friends and got used to the new community. The story is well edited and goes smoothly, will appeal to children 3-6 years old, especially those with pets. The illustrations was bright, beautiful and perfect to the story. It’s unique style of photos of miniatures of dolls and settings. You can see those fine details of these miniatures. No matter the textures and patterns of the fiber, or the cute decorations on lamp, or the little flowers in bushes, are all very well arranged and done. A very delightful and sweet story. The Apple pie – a sweet treat that father prepares for his daughter, tells us the sweetest love in this big world. Thompson tells the story in a cumulative form, and the fascinating part is that the cumulative form goes backwards yet Bean’s illustrations go forward in time visually. The text begins with the apples (“These are the apples, juicy and red, that went in the pie, warm and sweet, that Papa baked”) and then moves on to the tree that grew the fruit, its roots, the rain, the clouds, the sky, the sun, and finally the world (“blooming with life”). You see Papa picking apples, baking the pie, and coming with his daughter for a picnic under that very apple tree. Bean’s fine folk-style illustrations were drawn in black, brown yellow and a bit red, the simple palette wonderfully complement this emotional tale. Colors help set the mood of each spread, and the scribbly style lends the illustrations a slightly retro feel. 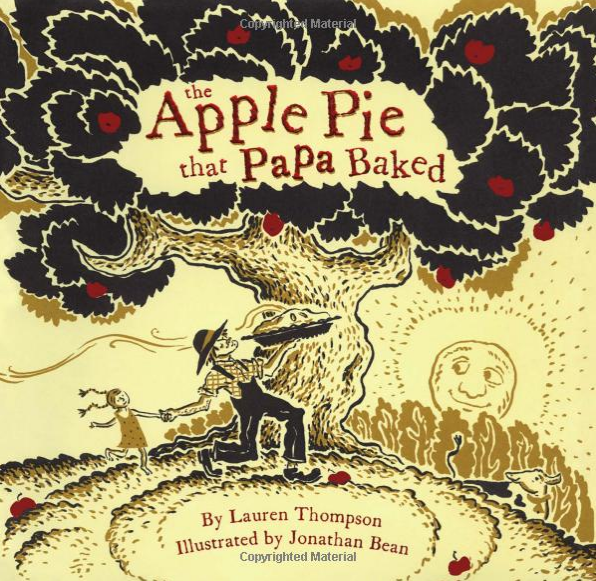 In the ending while the text goes far and far to encompass the whole world, the illustrations focus down and down onto the apple pie shared by father and daughter in a homey setting, leading the story to its sweet conclusion. A delightful and engaging read, a charming and sweet story for little ones and parents. 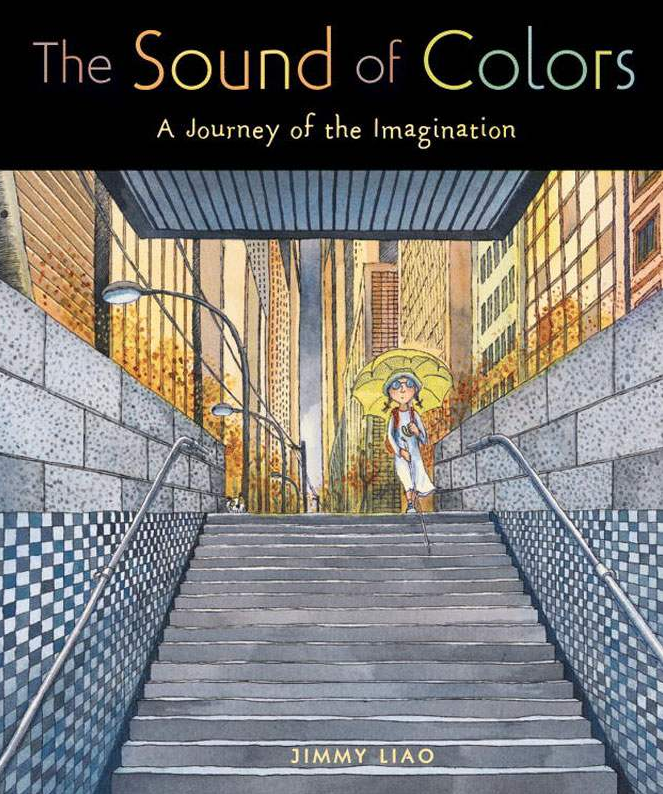 “Color of Sounds” tells a story of a blind young girl who ventures on a subway trip using her imagination to take herself and readers on a journey. “I have a journey to go on. There are some thing I need to find.” (from the book) It starts out slowly. She wonders the places the trains might take her and the passengers. She exits the stations where the field full of the golden leaves; She flies with clouds in different shapes and colors; She follows a line of elephants upstairs and downstairs; She is lonely on those dark nights or rainy days; She sits in a library with orange sunset glowing through the window; She lies on the back of a whale and listens to the sound of breeze; At last she returns home to find the light she’s looking for, “in my heart”. The final image is of the girl entering a home that has vibrant stained glass walls of enormous colors, images, and comforts. The story is not only about a blind girl’s experience or imagination, it’s more of a metaphor of adult life. The light glowing in heart is what makes life bright. To keep a good spirit and always think positively. There is no “wrong train” since whichever train could bring us to a new place, there is no “wrong stop” since whichever place could make us comfort. To take trains to myriad stops metaphorizes the decisions and options in real life, we could get anxieted and stressed of unknown steps next, or become fearful of not achieving what we are looking for initially. But we do have other options, to keep eyes and heart open for our surroundings, we could still enjoy the whole journey, and even find something more meaning and enjoyable during this process. While the book labels as children’s book, it may be read at many levels, and actually I feel adults can understand deeper. The watercolor style and the details of every single page simultaneously present many emotions and moods, such as fear, comfort, solitude, hope, wonder. The heroine is independent and strong, her journey highlights the light glowing in heart and ignites thought of possibility and transcendance when facing difficulties and changes.